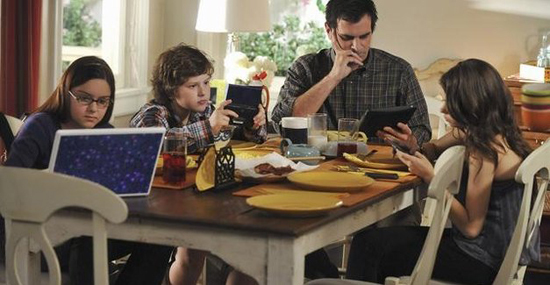 Do smartphones really hurt normal social relations? As regular readers/viewers know, I’m not a terribly big fan of smartphones. For more info, see my video Why I ditched my smartphone. In response to my musings, many people have said that they don’t think people buried in their smartphones all the time is causing any real harm. After all, they argue, people used to just bury their noses in newspapers – right? While it sounds good to say that people still avoided communicating with each other in the past by simply reading a newspaper instead of staring at their smartphone, there are a few problems with this theory. While I do remember my parents and grandparents reading the paper at the table – usually at breakfast – I don’t remember the same thing ever happening at dinner. Dinnertime was kind of sacred. The idea was to be there, together, as a family. 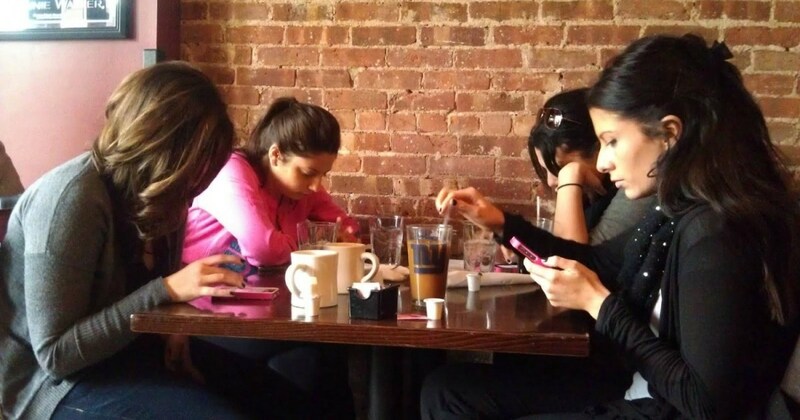 Nowadays, it’s not uncommon to see a table full of people at a restaurant, all staring at their smartphones. So clearly, there is something different about smartphones vis-a-vis a simple newspaper. The pull is obviously much stronger. 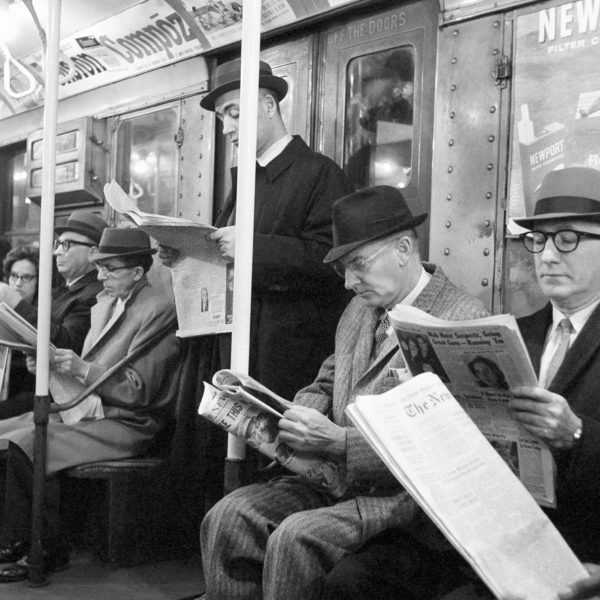 And it’s true that people used to read newspapers on the train, for example. Some still do. So, in that simple sense, no – there isn’t much difference. You can’t take a selfie and instantly post it to Facebookstagram with a newspaper. You never saw a table full of people at a restaurant, all staring at newspapers. No one ever slept with their newspaper on their nightstand next to their bed. No one ever instantly grabbed their newspaper to see who liked their stuff or sent them a message in the morning before they even finished waking up and getting out of bed. Yes, actually. Way back in 2012. There’s an interesting study entitled: Can you connect with me now? How the presence of mobile communication technology influences face-to-face conversation quality by Andrew K. Przybylski and Netta Weinstein. You can download a PDF of the study (or see the above page). So, what did they find six years ago? They did an experiment where people would discuss some casual topic, or they would try to discuss something more personal. In both cases, sometimes there was a cell phone nearby on a table, and sometimes not. The idea was to see if the mere presence of a phone would influence how people interacted with each other socially. Given that the effects do not appear to depend on conscious awareness, it is possible that phones operate as a prime that activates implicit representations of wider social networks, which in turn crowd out face-to-face conversations. It is also possible that people form individual and enduring implicit associations with phones; and such attitudes, behaviors, and cognitions interrupt here-and-now interactions. In other words, you don’t even have to be using your phone. The simple presence of a phone – even if turned off – will more often than not impede your genuine relations with other human beings… assuming that you are a typical smartphone user. In a similar vein, an expanding body of qualitative research (e.g., Srivastava, 2005) suggests people form important and diverse kinds of connections to their personal devices. If you’re a “normal” smartphone user – or even a text and call-crazy dumbphone user – the phone represents a connection to a wider yet less personal group of people. It’s more or less a symbol of “not intimate” conversations and interactions, so the presence of the device may tend to put our brains in “shallow socializing” mode. Of course, the real problem isn’t really the phone; it’s our apparent desire for more shallow relations, narcissism, and potential fame or “well-known-ness” that can only be had at the expense of deeper, more real interpersonal connections. Still, this era of selfies and smartphones and “social networking” is clearly not at all what it claims to be – or perhaps what we think it to be. There simply is no substitute for good old fashioned real human interaction. Things like body language, facial expressions, and other subtle non-verbal communication cues are essential to actually bonding with another person. So is actually taking a risk or two, revealing parts of our personalities and personal histories, and allowing ourselves to be vulnerable and open to another human being. In the end, that’s all way better than even a million “Likes” on some silly web site or app. The world is a better place with you in it, Scottie!